Oslo is a great city. If you want to see the fjord, you better not have to visit Oslo. You can go to Bergen. If you wish to visit to Oslo, it is better not to be too long because the price is very expensive necessity in Oslo. But it does not deserve to be overlooked if you are wealthy travelers. Oslo is not only the capital and the largest city in Norway, but also central of culture, economics, science, and government, but also the natural beauty of Oslo is surrounded by mountains, green hills, and the Oslofjord. Oslo is one of the most expensive cities in the world, the second most expensive after Tokyo. The city is also a very compact, namely utilized maximal land so the city is not expanding. With a short distance, it’s easy to surround the town on foot or using bicycles that you can rent all over downtown. Oslo is also often received awards from multiple organizations such as The Most Liveable City and The European Sustainable City Award. 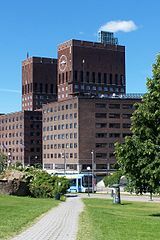 From Gothenburg to Oslo, you can use Swebus of Nils Ericson Terminal in Gothenburg towards Oslo Gallerian terminal. For air line, Oslo has three airports, namely Sandefjord Airport Torp, Rygge Moss Lufthavn, and Oslo’s Gardermoen international airport that is. From Oslo Gardermoen Airport heading, you can use the train or bus Flytoget and Flybussen.